Mayon volcano has erupted in the Philippines, killing four German climbers and their guide. Mount Mayon at 206 miles south-east of the capital Manila sent a cloud of ash and rocks into the sky early on Tuesday. The ash blast caught a group climbing the mountain, which is famous for its near-perfect cone. At least seven other climbers were hurt in the eruption, which lasted for just over a minute. “Five killed and seven are injured, that is the latest report,” National Disaster Risk Reduction and Management Council chief Eduardo del Rosario said. Four of those killed were German nationals and the fifth was their Filipino guide, the NDRRMC said later in a statement. A guide on the mountain told a local television station by telephone that those who died were hit by the rocks that rained down on them after the ash blast. Twenty people were approaching the summit of the mountain when the eruption occurred. 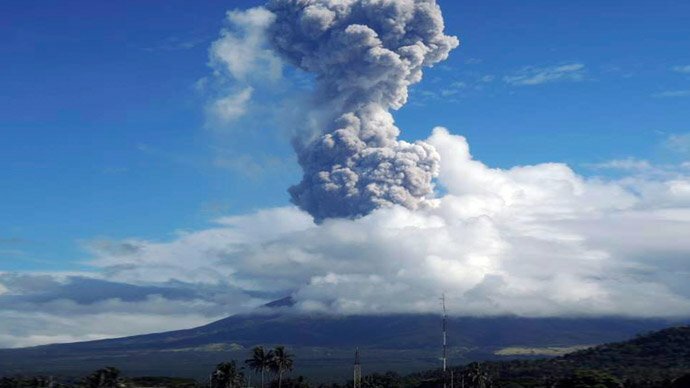 In an advisory, the Philippine Institute of Volcanology and Seismology called the eruption a “small phreatic event” that lasted about 73 seconds and sent ash 500m into the air. No intensification of volcanic activity was observed, it said, and the alert level would not be raised. It said small steam and ash ejections could occur with little or no warning and advised against entry to the 4-mile radius Permanent Danger Zone around the volcano. Chief state seismologist Renato Solidum described the eruption as a “stream driven explosion”, a “normal process” in any volcano. There was no need for local residents around the mountain to evacuate, he said. Mt Mayon has erupted at least 48 times since records began. The most violent eruption, in 1814, killed more than 1,200 people and devastated several towns. The most recent eruption was in late 2009, when tens of thousands of local residents were forced to evacuate as the volcano rumbled back to life.